Interested in remodeling your kitchen? In this post, we’re sharing some of the most amazing luxury kitchen features that will help you create a kitchen that’s functional, beautiful, and most importantly, a space you and your family love. When investing in a remodel, we’ve known too many homeowners who focus only on making kitchen updates that will, in theory, increase their home’s resale value. Time and time again, we see how doing this results in a space the homeowner is not 100% happy with. 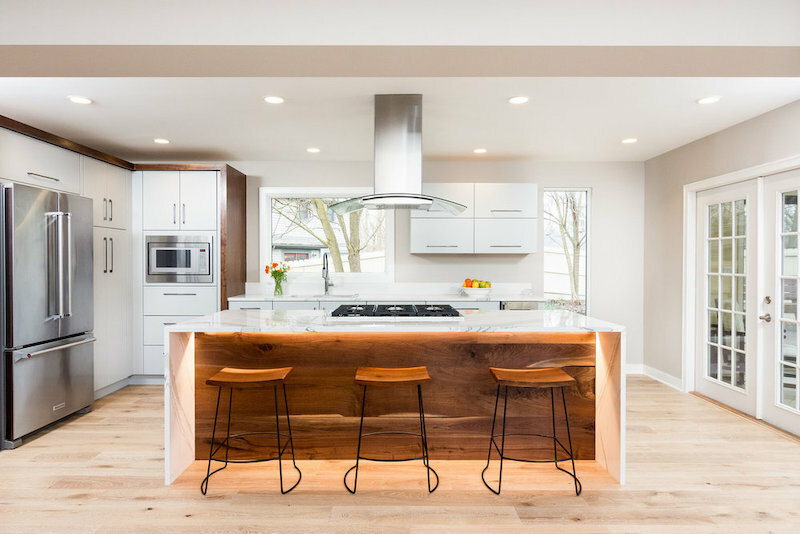 At Forward Design Build Remodel, we give you full permission to make kitchen remodeling decisions based on what you love — not what features and updates will add the most resale value. You’re the one living in your home, preparing meals in the space, and sitting around your kitchen table every day. You should be the one dictating what features you want and how you want the space to look — not the next person who might own the house. Never feel guilty about investing in the luxury kitchen features you dream about. Even if doing so many or may not pay off in terms of resale value, your enjoyment and love of the space is reason enough. Modern home designs are built with an eye toward effective and beautiful storage solutions. Walk-in pantries are a great example of this and offer a central spot in your kitchen to keep non-refrigerated food products as well as other kitchen-related items requiring special storage. Your pantry can be catered to your specific needs — as large or compact as you need it to be and designed to your specifications — from built-in shelves to electrical access for a second microwave or even a wine refrigerator! Instead of closed off or cornered, an open floor plan kitchen is a bright and inviting social space. What you may not know before beginning a remodeling project, however, is what a luxury it can be to open up walls in a home! The benefits of an open kitchen — from providing a great area to entertain guests to inspiring togetherness in families — tend to outweigh the costs for those willing to take the leap. For example, an open floor plan allows parents to cook and prepare meals while keeping an eye on kids doing homework at the table or playing in the living room. It’s hard to find a reason not to love this modern-day design! Built-in refrigerators are always a crowd-pleaser. This luxury kitchen feature allows for a beautiful, seamless look in your kitchen. Unlike freestanding refrigerators, built-in refrigerators sit flush with your cabinets and can even be built to match the design and style of your cabinets. For busy families and those who love to entertain, the benefits of a double oven kitchen cannot be overstated. With a double oven, you’ll never worry about how you’ll cook multiple dishes at once or ensure your meal is ready at the correct time. Instead, each oven can be set to a unique temperature, allowing you to cook or warm multiple dishes at once! If your stove is located far from your sink (or even if it isn’t! ), pot-filler faucets provide a huge amount of convenience. These cold-water faucets are mounted above your stove top, allowing you to easily fill your pot with water and avoid the precarious trip across the kitchen. This second sink in your kitchen — commonly found in a kitchen island — is highly requested among larger families or for those who do a lot of cooking. Similar to a pot-filler faucet, this luxury kitchen feature is all about convenience; it allows two people to prep food at once and makes it easy for other people to wash hands or grab a drink of water while you’re cleaning dishes. Often our clients will add a garbage disposal to this prep sink to further save time, prevent clogs, and keep things clean. An instant hot water faucet is a quick and easy tool to help you avoid heating a kettle. This feature typically sits and runs right off your normal sink and can be added to your primary or prep sink (or both!). These are perfect for coffee and tea, hot cereal, or anything you need in a hurry. During cold winter months or early in the morning, there’s nothing quite like a heated kitchen floor. This luxury feature is also a great option for those who suffer from asthma or have respiratory concerns, as it warms your home without stirring up dust, dirt, and pollen. Your indoor air quality will be off the charts! Bamboo flooring is usually the prefered choice for radiant floor heating due to its beautiful looks and ability to withstand fluctuations in humidity and heat. Light is incredibly important for creating a comfortable and functional kitchen environment. One unique method for adding non-direct, ambient lighting is through under cabinet fixtures. These LED fixtures provide a warmth and utility in your kitchen and may help you save money on your energy bill. We’ll help you design and build the kitchen of your dreams. What’s your favorite luxury kitchen feature? 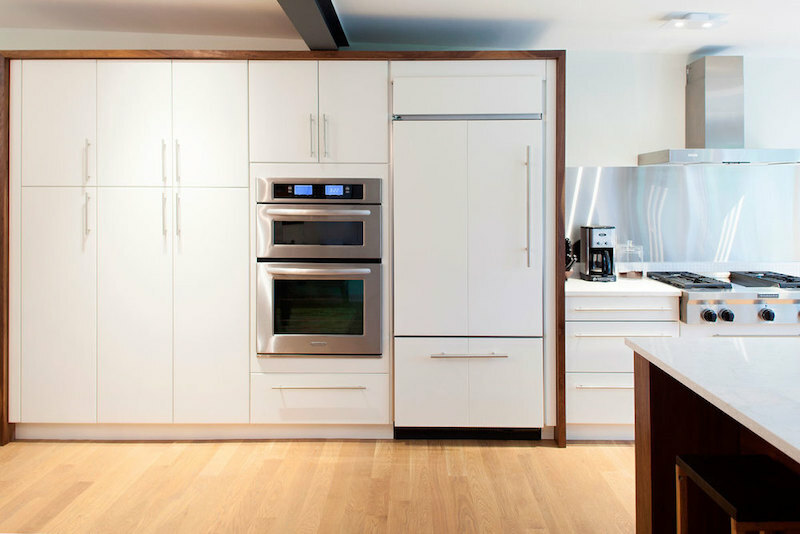 At Forward Design Build, we know that the modern-day kitchen is so much more than just a spot to prepare meals. It’s where your family spends time together, a place for entertaining, a spot to sit and relax after a long day. We help homeowners throughout Ann Arbor build spaces that perfectly fits their needs and style preferences. Let’s create a kitchen complete will all the features you need and want — we’re here to help.